For our complete coverage on the issue of homelessness, click here. Photo by Brian Addison. 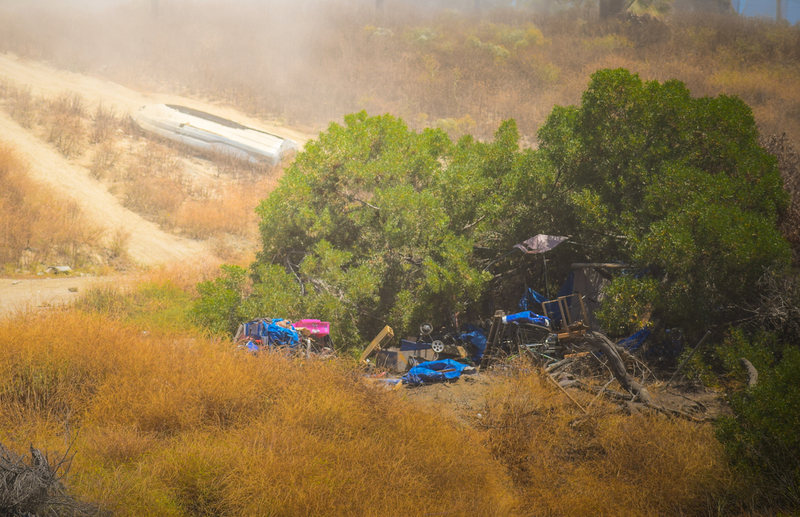 Above: an encampment used as shelter by those experiencing homelessness on the east bank of the LA River. According to Price’s Chief of Staff, Jack Cunningham, the office eschewed “furniture, or office decorations, or food for community meetings, and reducing—not increasing—staff costs” in order to garner some $18K to pay the special part-time prosecutor. Moussavi noted that those experiencing homelessness often create “chop shops,” or collections of either stolen or thrown away bike parts in order to, depending on who is framing the situation, help out other folks on getting around more efficiently or use the parts to trade for drugs or money. When asked if folks in the Shore protect their bikes correctly, Brooke simply laughed. “Wide open spaces,” she began to sing, mimicking the Dixie Chicks song. I’ve been explicit about my feelings about how folks lock their bikes, which are in and of themselves a new form of currency. Price herself had her bike stolen off of 2nd Street while she has dealt with a plethora of complaints about bike stealing issues. The only issue is that, with my work at the DLBA as their former Communications Manager, that was not remotely the case. While Broc Coward, Chief Operating Officer of the DLBA, did not want to be quoted for this article, there are significant differences between the DLBA and the 3rd that I can easily testify to. For one, in terms of the DLBA’s Community Prosecutor Program, they have Antoinette Hamilton, their Homeless Outreach Specialist, that works day-to-day, face-to-face with those experiencing homelessness—to the extent of knowing the vast majority of them by name as well as their background. Her tactics are typically paired with a Quality of Life Officer and DHHS representative. The focus would be on habitually dangerous individuals; not low-level crimes. Meaning those who have mental illness medications they are unable to access, those who threaten the lives of others on a continual basis, or those that present a health concern to themselves or others. Following that—and only following that—would the DLBA turn to the Community Prosecutor. In fact, in my first year at the DLBA, the amount of cases the DLBA referred to the prosecutor? One. And that is mostly likely because the DLBA is targeting homelessness and the misdemeanors attached to them through personal intervention and mental health security first before taking them under the legal wing of being prosecuted. Even more, the DLBA’s program is not specifically directed toward low-level crime or crimes committed by those experiencing homelessness; they were geared toward what were often called “hot spots” where we’re not talking stolen bike parts; we’re talking drug dealing, gang affiliating, prostitution (sadly sometimes in exchange for food or drugs), and other issues. Perhaps the 3rd should take a cue from the DLBA and look into hiring, first and foremost, a Homeless Outreach Specialist, someone who not only understands the law but also the human factor of the experience of homelessness, why they resort to crime, and how to create social norms through face-to-face interaction rather than law. Having such a specialist marks a particular turning point for how a community can addresses this issue: putting a day-to-day person dealing with those experiencing homelessness face-to-face. “Having a specific prosecutor handling the cases from this target area will expedite the connection to services for those persons in need of mental health, substance abuse assistance, and other services,” Cunningham said. While I am sure many are cheering the arrests of those experiencing homelessness for stealing a bike wheel, I can assure you that it would behoove us—if we’re going to stop giving City Staff minor wage lifts or providing snacks at community meetings—that maybe the extra money could be spent on creating more Antoinettes. Take, for example, the efforts her and partners Mental Health America of Los Angeles and Urban Community Outreach (UCO) took to help those getting displaced at Lincoln Park in order move forward with construction of the new civic center: 65 contacts were made with those approached are provided all the information they need in order to connect with services, including travel if need be. This is in addition to the weekly outreach efforts that were occurring in the park, where an average of 25 contacts were made. Even more, the homeless population has many members who don’t even call Long Beach home. These folks are simply trying to get home or find a connection—and in the case of the efforts of UCO last year, 12 people had been given complimentary travel in order to reconnect with lost family and, just as importantly, get a roof over their head. UCO and Antoinette’s efforts don’t stop there. The following weekend after those efforts back in March of 2016, four families were given motel vouchers while other families that needed assistance with a utility deposit, food and gas funds were assisted. Community effort is more than just enforcing laws.